This is a sad news concerning a hero who died from the same virus he treated with. 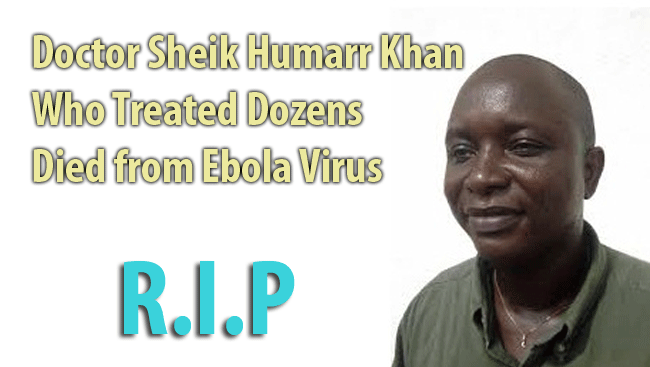 Dr. Sheik Humarr Khan died of Ebola virus after being quarantined from the disease. The thing is this doctor has treated dozens of patients from the said virus and this is what happened. This has saddened the medical field. Khan risked his own life just to treat a lot of people from the said virus that has been spreading and making an outbreak in different countries. Ebola virus can spread through the body fluids like urine, sweat, blood and saliva. And since the kinds of people who are mostly prone to dealing with patients are health workers, their lives are at risk. To give evidence on such, two American health workers are currently hospitalized in Liberia from the said virus. Talking about Ebola virus, this has killed a lot of people. In fact, in countries like Sierra Leone, Liberia, Guinea and Liberia, this has caused the biggest number of death related to outbreak in history. This is the reason why people should be more vigilant knowing the fact that it has 60% fatality rate. The chairman of the Liberia Airport Authority board named Binyah Kesselly said that police are now in the airports of Monrovia to see to it that the passengers will undergo screening in order to stop the spread of the disease. There is already a strict implementation of this law so that fatalities from the said disease will be stopped as reported by Inquirer. Ebola virus should call on the attention of the world since it is greatly affecting so many countries. And to know that one of the heroes who saved so many lives against the said virus was taken by Ebola itself, it means to say that nobody is exempted from such.